Well, I am finally getting out Halloween pictures posted. I wish Halloween was on Saturday every year. It was so nice to not have to rush home from work and school to hurry and get ready to go trick or treating. We left early enough that we were able to go to all of our friends and then on to our families. We were able to stay a visit awhile. It was nice not to have to rush. 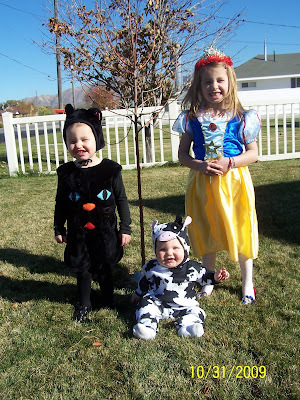 Sydney was Snow White, Shelby was a cat, and Preston was a cow. Sydney wasn't too happy that I wouldn't spray paint her hair black. 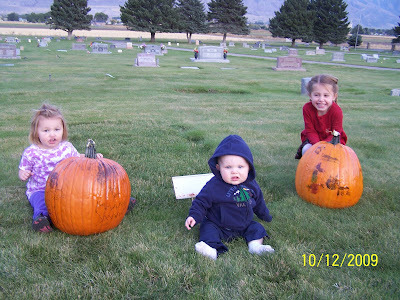 For my dads birthday the girls decorated pumpkins and took them up to grave. I can't believe that is has almost been 2 years since he passed away.